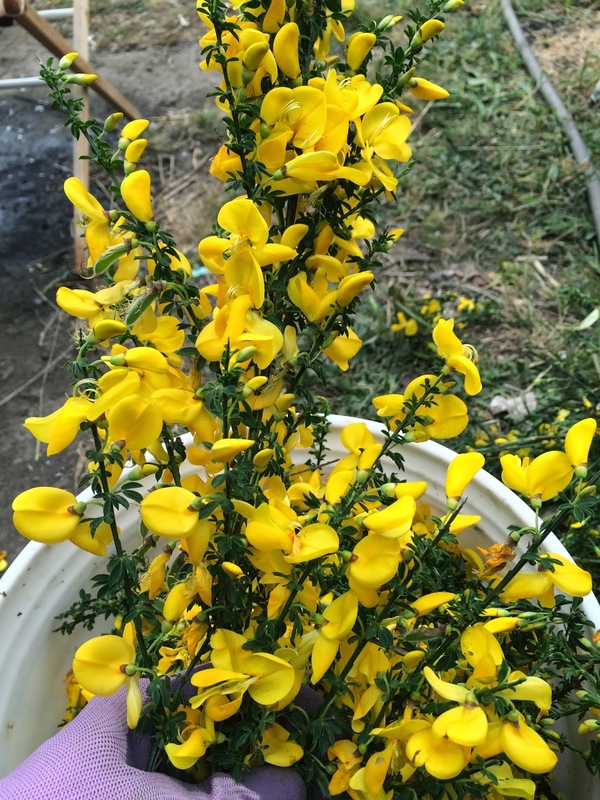 That pesky, pesky scotch broom, it's so pervasive, and abundant, and downright invasive. Here is a clue as to why this is so: if you direct your attention to "Exhibit A", above, you will notice that this small sample of scotch broom (Cytisus scoparius) branch is literally covered in flowers. There are probably more than a hundred blossoms on this one little piece. Each of those flowers forms a seed pod, which, given the general characteristics of plants in the Fabaceae (Pea) family, contains approximately 6-10 seeds. After the seed pods mature, they dry out with the cessation of the rain. On a hot summer day, if you listen carefully to a hedge of scotch broom, you can hear a crackling that sounds curiously like a grass fire. The pods burst apart, throwing the seeds away from the plant. In this small sample in the photo, if there really are a hundred flowers, this little tiny branch will make 600-1,000 seeds! This may have something to do with why our property was about 40% covered in scotch broom when we bought it! We are now nearly 10 years into managing this invasive plant on our place, and are clear it will be an ongoing project throughout the rest of our lives. Fortunately for us, there are a few redeeming qualities of the yellow scourge. For one, the plant fixes nitrogen, which is a great boon for our wind-deposited soil. If you don't mind all those seeds spewing forth, it makes a great windbreak, and this time of year, it's like sunshine on a gray and cloudy day. And I have also discovered that it makes a decent yellow dye for my yarn project, Lost Coast Yarn. Scotch broom is closely related to French broom, a traditional yellow dye plant. It doesn't take much material to create a good yellow. Though I won't be harvesting enough to make a dent in the crazy quantity of broom all over our land, I am clipping the most flowery branches to dry and to use as dyestuff. Here's to turning our waste-products into resources! Cheers!